Notes about drumming: Live percussion (Djembe and conga drums, shekere, cowbell, misc. percussion) was used in the initial production. 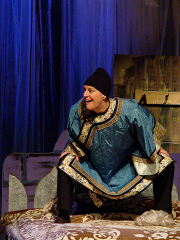 Suggestions for scoring are included in the stage directions. Although you can never match the power (and the fun!) of live musicians, recorded percussion sounds would be an acceptable alternative. 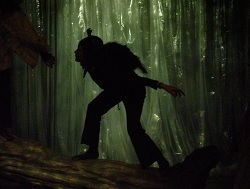 The Intruder was premiered in 2007 as a collaboration between the Northfield Arts Guild Theater and ARTech Charter School in Northfield, Minnesota, with support from the Southeast Minnesota Arts Council. The “thunder snow” during the first performance made it even more surreal for those audience members who were able to get there through the raging blizzard.